Hans Wegner’s trade began shortly after his apprenticeship to a cabinetmaker at age 14, and it matured during and after his furniture design studies at the Copenhagen Technical College. From there, his career as designer and maker of fine wooden furniture accelerated. The fine quality, simplicity and tradition of Wegner’s works placed him among the school of Danish modernists of the 1950s. Italian sculptor, university lecturer and furniture designer Harry Bertoia displayed a unique stroke of genius with his patented Diamond Chair for Knoll International in 1952. Bertoia was an inventor of form and an enricher of furniture design with his introduction of a new material: he turned industrial wire rods into a design icon. Educated at Detroit Technical High School, the Detroit School of Arts and Crafts and Cranbrook Academy of Art in Bloomfield Hills, Michigan, Bertoia taught metal crafts at Cranbrook. 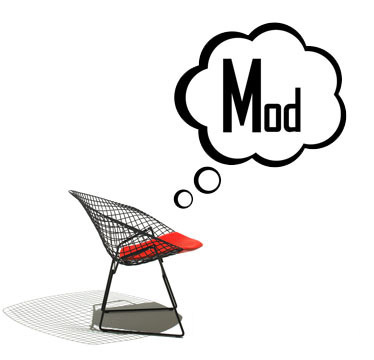 He worked with Charles Eames to develop his signature molded plywood chairs. Eero Saarinen commissioned him to design a metal sculptured screen for the General Motors Technical Center in Detroit. His awards include the craftsmanship medal from the American Institute of Architects, as well as AIA’s Gold Medal. As a muti-talented architect, Arne Jacobsen conceived a signature design language that merged modernism with his Scandinavian reverence for nature. He possessed a unique ability to balance the bold and feminine form against superior function and industrial capability. Jacobsen's relationship with Fritz Hansen, which began in 1932, furthered his name and influence in furniture history. His talents made him one of the outstanding designers of the 20th century. Alvar Aalto studied art, design and form through his extensive European travels, architecture studies in Helsinki and lengthy, experimental career. After testing the potentials of wood - especially bentwood - with his first wife, architect Aino Mariso, he designed furniture and several buildings, including a sanitorium in Paimo and mucho of the Sunila Cellulose Factory. In 1935 he co-established the first modern furniture shop in Helsinki. Two years later he designed glass pieces for Ittala, including the Savoy vase, later produced by Knoll. Aalto enjoyed a well-recognized career, celebrated with many honors, teaching and guest lecture positions, as well as several exhibitions.